KATHMANDU, July 14: The Supreme Court on Friday ordered the government to submit the file on the decision to ban protest activities in the capital. A division bench of Justices Hari Krishna Karki and Dambar Bahadur Shahi issued the order following court hearings. The bench directed the government to submit the file on the decision of the chief district officer and the District Security Committee in relation to the ban. During the hearings, lawyers representing the petitioner had condemned the decision, saying it intended to limit the right of citizens to complain against government actions. On July 6, the Supreme Court had issued a stay order against the government decision to ban the staging of protests . 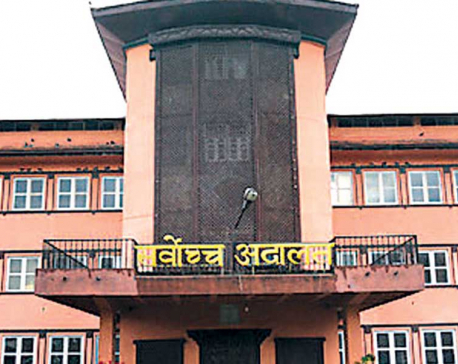 Justice Ishwor Prasad Khatiwada issued the stay order, acting on a writ petition filed by senior advocate Dinesh Tripathi. The bench also summoned the government authorities -- Office of Prime Minister and Council of Ministers, Ministry of Home Affairs and district administration office—to attend the hearings today for discussing whether to give continuity to the stay order or not. 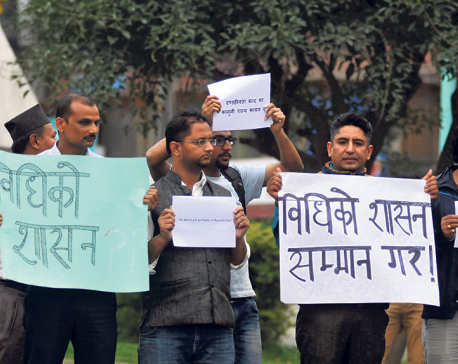 Senior advocate Tripathi had registered the petition challenging the ban decision, naming the Office of Prime Minister and Council of Ministers, the Ministry of Home Affairs and the district administration office as defendants. The petitioner sought the apex court stay order to suspend implementation of the ban imposed by the Council of Ministers on April 15. The order prohibits the staging of protests in the capital city including at Maitighar Mandala. The ban was imposed by Chief District Officer Kedar Nath Sharma as per Section 6(3) of the Local Administration Act, 1972 and on the basis of the recommendation of the District Security Committee in February. The order imposed a ban on staging protest activities, organizing sit-ins and picketings. The government banned the protests including in front of Shivapuri School; Kanti Children's Hospital ;the Police Hospital; the residential localities of the prime minister, the speaker, the chief justice and the vice president; the parliament building; the New Baneshwor area; the Singh Durbar, Bhadrakali area; Tinkune; Singh Durbar gate area; Padmodaya area; and Singh Durbar main gate. The petitioner claimed that the protest ban violates the freedom of expression and freedom of assembly enshrined in Article 16, 17(1)(2) and 18, and sought apex court intervention through an extraordinary order. as per Article 46 and 133(2) and (3) of the constitution.